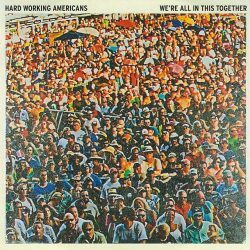 Hard Working Americans are what might be called a “supergroup” in some circles, with members being drawn from Widespread Panic and the Chris Robinson Brotherhood. The band’s musical credentials are impressive and they have a good sound, based fairly firmly in the southern rock genre. Formed in 2013 they’ve put out three albums prior to this new release without ever really making much impact outside the U.S. and it’s hard to see this latest release being the one to change that. “We’re All in This Together” is a live album (as was 2014’s The First Waltz) and it’s really one for the established fan. The album was recorded during the band’s 2016 tour with the bulk of the recording taken from a gig in Birmingham, Alabama. It gets off to a good start with Mission Acomplished, a track with more than a hint of Little Feat about it. The band are tight and the track has real punch. If the album had continued in this vein it would’ve been a bit of a gem but, unfortunately, by the end of track two, I Don’t Have a Gun, we’re already into live album cliché territory, with vocalist Todd Snider working the crowd with the title track exhortation that “we’re all in this together”. Hmm. It turns out that the band’s name is a clever marketing device, allowing Snider to keep reminding the audience that the band are “Hard Working Americans – just like you guys”. It’ll be interesting to see how they work the name when they’re playing outside the US. The album continues in much the way you would expect – lots of whooping and hollering from the crowd, frequent forays into extended guitar solos, much talking at the audience and asking “are you with me” and other standard rock concert fare. It is all extremely well done and there’s no denying the musical quality of the band but, as an album, it all gets a little boring – if you were there it was probably a great concert but it doesn’t transfer to disc that well; you need a live atmosphere to make a set like this work properly. This is a good band with some great material but this album doesn’t show them at their best. The established fans will, no doubt, love it – especially the ones that saw the tour – but this is preaching to the choir; they’ll capture few new fans with this release. Cliched live recording from a competent band that should be more exciting than this album suggests.